In 2018, pickup trucks and crossover SUVs now reign as the top selling vehicle models in the United States, which wasn’t always the case. It was just a few years ago, when midsize sedans were the most sought after vehicles. The three sedans at the top of the list included the Toyota Camry, Honda Accord and Ford Fusion. If you want the best advice on which ones to buy, the most trusted opinions come from independent auto experts or awards that are judged by professional auto writers. Out of the many vehicle of the year awards, the North American Car, Utility and Truck of the Year Awards, is the industry’s highest honor. It’s voted on by a panel of 60 independent journalists. For 2018, the new 2018 Honda Accord was awarded the North American Car of the Year. The judges also selected the new 2018 Lincoln Navigator as the Truck of the Year and the Volvo XC60 won the SUV of the Year. Prior to the Internet, many of us sought advice from the auto enthusiast in our family or community. Now you can get the opinion of 60 auto buffs at once. For the 2018 model year, Honda launched a new Accord and a Hybrid version. The regular Accord offers six trim levels. The base, LX, Sport, EX, EX-L, and Touring. The Honda Accord Hybrid, which I tested comes in four trim levels. The Base is $25,100, EX is $28,890, EX-L is $32,440, and it’s $34,710 for the Touring. They are all powered by an energy efficient 2.0-liter I-4 engine which generates 212 horsepower and averages 47 MPG. The differences in costs are based on the amount of convenience, entertainment, and safety features. In comparison, the Honda Accord Hybrid gets more horsepower than the gasoline powered Accord. The Hybrid gets 212 horsepower, compared to 192 hp in the regular Accord. 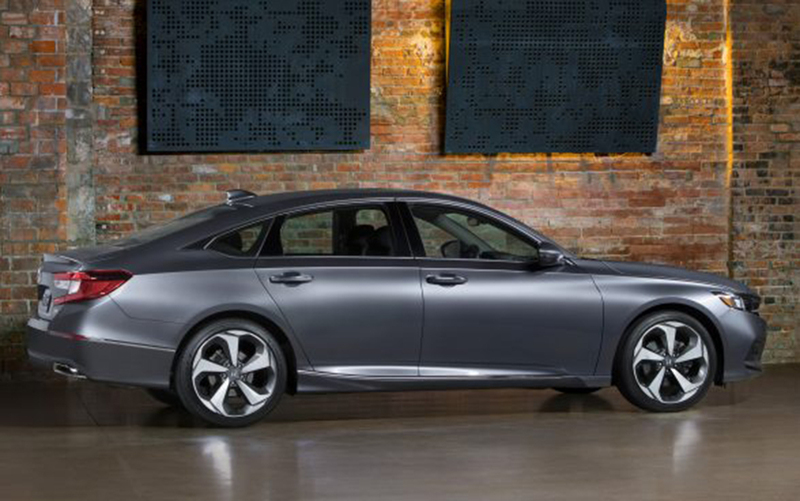 The Hybrid averages a combined mpg of 47 compared to 33 mpg for the regular Accord. The Hybrid uses a gasoline engine to generate power to its electric motor, which then propels the vehicle. The Accord Hybrid can also operate in a limited all-electric mode. Regenerative braking also helps to recharge the battery. The crystal black 2018 Honda Accord Hybrid Touring I drove included many of the features that come in more expensive sedans and is loaded loaded with a host of safety and driver assistant technologies. Some standard features include recognition of traffic signs, wireless device charging, lane departure warning, adaptive cruise control, and head-up display. The battery was moved under the rear seat in the newly redesigned 2018 Honda Accord to make more room for rear seat passengers and add three more cubic feet of truck space.